I’m probably one of those ‘flustered shoppers’ squeezing in last minute holiday shopping a week before Christmas, thoroughly combing down the mall shop by shop. However, as frazzled as I may seem, you’ll never find me wandering aimlessly. There’s often a method to my madness; I usually shop somewhat like a man—with a goal and target in mind. Instead of going to the mall clueless, I set aside some time filling up my who, what, where list: Who for, What it is, and Where to get it. It makes shopping much more efficient, and I promise, you’ll find yourself less frazzled and bewildered. Here are some gift ideas, $200 & under for those near and dear to you (links available below). 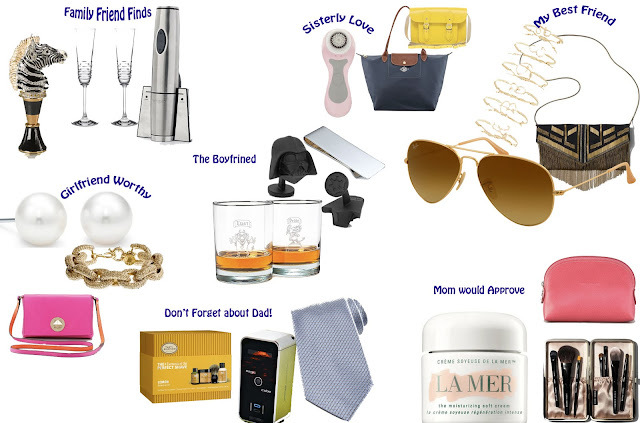 My older gift guide is also available here--($100 & Under Guide). Hope these categories come in handy and spark some ideas this Christmas. I am currently in APO AK right now :) Myrtle told us about your blog! I have a blog, too! Thanks for checking my blog out! Your blog looks great~love your tips, outfits, and hauls! :) Thank you for the nomination! I really appreciate it :) Keep up the good work! Look forward to reading future posts!